27 down – 2 to GO !! LAST WEEK : Well that was FUN , some might say too much fun , but i dont think you cant have too much fun ! Starting with BOOF is always a good start to the night , followed by Mon Shelford singin and struttin ..What a Gal . Then it was Flip your wig’s turn .Thats when the party started . When the man in gold lame and matching turban came on stage the dance floor filled and the band were in the pocket . Thanks Steve Purcell for launching yet another fine Belmar Records recording .. THIS WEEK-FRIDAY 7th Dec: Ross McLennan and the New World Orchestra . If you haven’t heard Ross’s music take a listen here . Or if you have heard Ross play with his BIG band you’ll know how rare it is to see . String section , horn section , all singing band . You don’t see Ross play with this line up too often understandably . Imagine trying to get 12 musicians in the same room at any time of year let alone 3 weeks from Christmas !! IT’ll be good , REALLY GOOD .. better book tho !! Previous Previous post: A night at Kastoria will cure your Dysphoria…true story ! Sign up here so we can let you know who's playing next Friday! 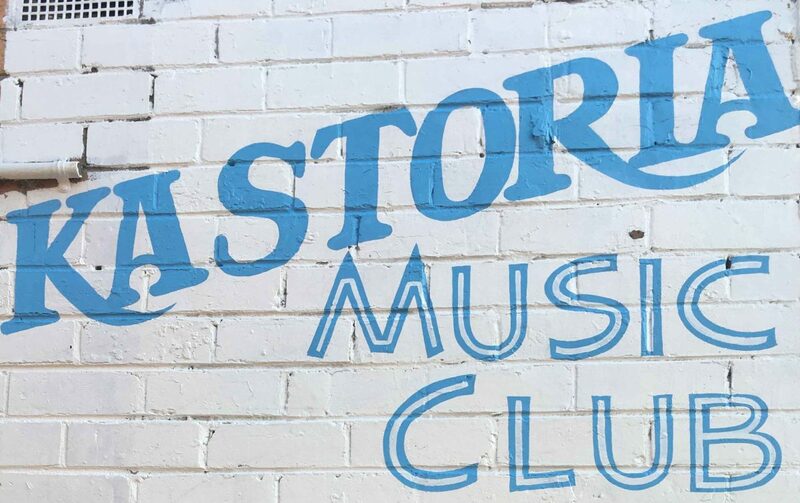 Kastoria Music Club Powered by WordPress.com.